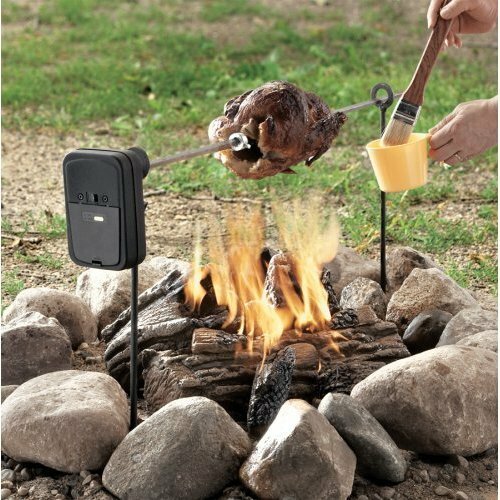 A portable and motorized Campfire/BBQ Spit Rotisserie – An essential for any BBQ or party on the beach, picnic in the wood or to use over a bbq or fire pit in your own garden. As the food is cooked slowly over a read fire it takes on all the lovely smoky flavours, naturally enhancing your food. The campfire/BBQ spit rotisserie also has some accessories such as a basket which is very popular with fishermen to cook freshly caught fish – there’s nothing tastes quite like it! The campfire/BBQ spit rotisserie and turn around 7kg of meat with ease. Three chickens can be cooked on each spit. The batteries will continuously turn the motor for 8 hours or more. 2 x D type batteries are required. Extra forks so you can have more than one joint of meat or chicken at any time, and a basket for chicken wings, sausages, fish, vegetables and much more.